Do you want a wolf but your significant other said no? 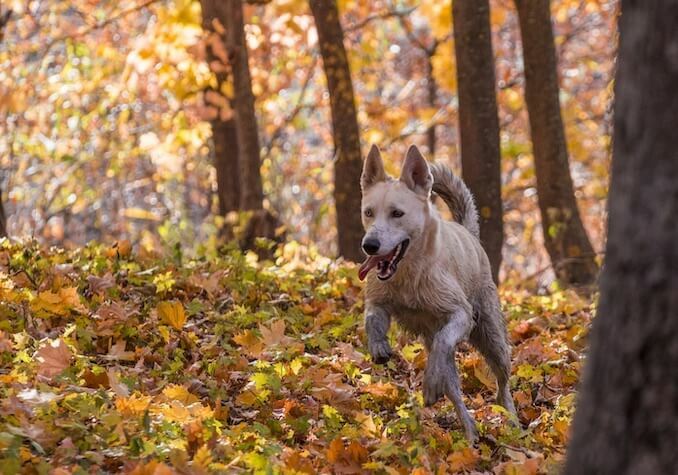 The German Shepherd Husky Mix is a strong, independent yet loyal, intelligent and a true pack leader. Half German Shepherd, half Siberian Husky. This friendly breed is perfect for any family with children and can even double as a trusty guard dog. Bold and magnificent. 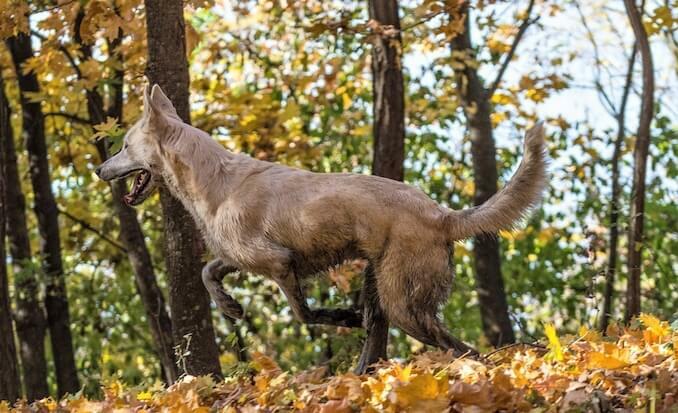 This athletic breed will satisfy any owner’s hidden desire of having their very own wolf. Commonly known as the Gerberian Shepsky a male will grow up to an average of 25 inches in height and may weigh up to 80 pounds. So, what else is there to know about this striking breed? Let us detail the history, personality and temperament, appearance and care guide so you can decide on your own if this dog is the dog for you. The German Shepherd Husky Mix is not recognised by any major American Kennel Club. A striking hybrid. The Gerberian Shepsky is a mix of two classic and intelligent pure breeds. The loyal German Shepherd is mated with an outgoing Siberian Husky giving us a mixed dog which may just be, the best of both breeds. Free Bonus: Want to Learn More about this mixed breed dog? 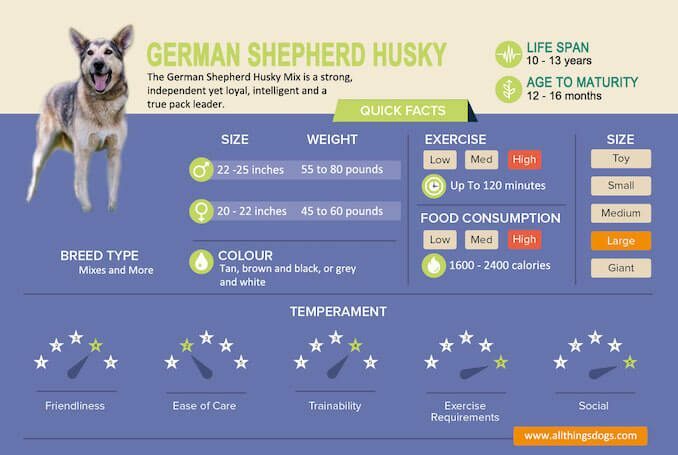 Download a copy of our free German Shepherd Husky Mix care guide. The litter size is approximately six to eight puppies. And like most mixed breeds, each litter will vary with some more dominant in appearance to either the German Shepherd or Husky parent. 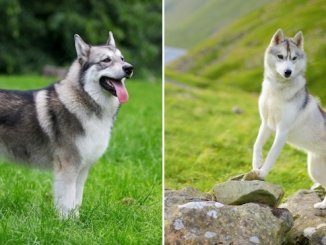 In order to take a glimpse into the history of the Husky German Shepherd Mix, it would be key to familiarise yourself with the history of each parent breed. The German Shepherd is a herding dog which first originated in 1899 in Germany. Whereas, the Siberian Husky is a sledding dog first bred 3000 years ago in Eastern Siberia by the Chukchi tribe. 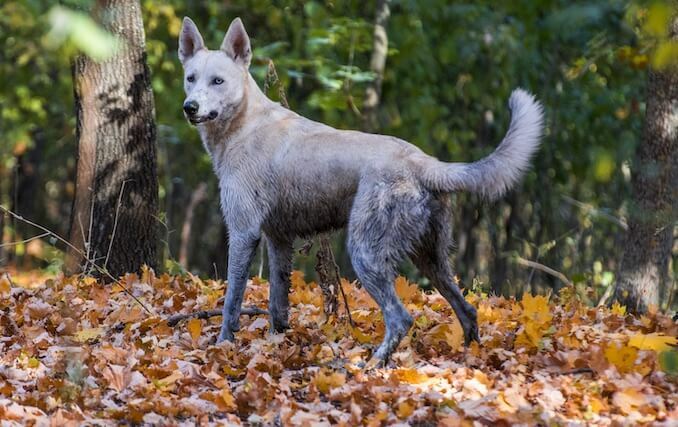 The true origin of the German Shepherd Husky Mix remains a mystery. There is no clear explanation as to why or where this breed was developed. However, its two purebred parents have existed for hundreds of years and are individually known as intelligent and bold working dogs. Today, the Gerberian Shepsky is not yet a well-known designer dog, like the Puggle or Cavachon, however, due to their wolf-like appearance, this breed is sure to take off soon. How long does the breed live? The German Shepherd Husky Mix has an average life expectancy of 10 to 13 years of age. How big does this breed get? Being the descendent of two medium to large dog breeds, you can expect this dog to get large. A German Shepherd Husky Mix will range between 20 to 25 inches in height and weigh from 45 to 80 pounds, with the female tending to be on the smaller end of the scale. How much does this breed cost? A German Shepherd Husky Mix Puppy will cost anywhere from a $350 USD to $1000 USD; the cost ultimately depends on the breeder. A mix bred from two purebred parents with pedigree will be more expensive. You can also try adopting a dog from your local dog shelter. The German Shepherd Husky Mix has a beautiful temperament. Bold, staunch and robust. This solid dog will protect you and your family from anything, making this breed a perfect guard dog. Deep down however, this dog is a loving and playful breed which will melt the coldest of hearts. The perfect family dog who is great around children. In fact, unlike us, they may actually be able to keep up with them. This breed is super intelligent and with the right, patient owner, they learn quickly and willingly, making them easy to train. Keep your puppy well exercised and trained and they will steer away from developing any negative habits such as barking or excessive chewing. Being such an intelligent breed, it is important that this dog is associated with an attentive owner. 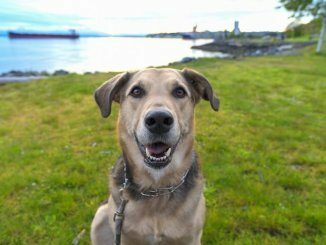 The German Shepherd Husky Mix may not be well-suited for first time dog owners. They do require a fair bit of your time so that their maintenance and training requirements are met. An active breed requires a diet packed with nutrients and protein; a large dog always has a large appetite to match. As the Shepsky is a large breed they will require a high amount of calories and protein, however, this changes in regards to their age, size and activity level. Ideally, once matured, it is best for this large breed to have their food spaced out over one or two meals per day. A German Shepherd and Husky Mix is a carnivore and therefore requires adequate amounts of protein with a diet containing no less than 22% of protein. To ensure your dog is ingesting the correct amount of nutrients and proteins, we recommend trying a high quality dry kibbled diet formulated for the larger dog breeds. The perfect companion for your morning or afternoon runs. This breed loves exercise. It is recommended that your Husky German Shepherd Mix gets approximately two hours of exercise per day. But, they are a “pawesome” breed, so definitely worth it. The best options for meeting such a high exercise requirement may be having a spacious and open backyard where your dog can play and keep busy. However, having a yard isn’t enough for this breed. The Shepsky is an athletic breed and therefore interactive runs and games are required to fulfil their exercise needs. Although an active breed, they still appreciates cuddles at the end of a long day. Even though this dog may resemble a big and strong wolf, it is still an extremely loving mix so show them some love. Don’t have time to consistently train your puppy? Look at volunteering or dog walking instead of owning a dog. It is true that this breed is very intelligent and therefore it may be quite deceiving just how easy they can be trained. Due to their Husky parent, with its working and pack nature, the Gerberian Shepsky can be quite a stubborn breed so initially training can be a little rough. Like any dog, they will respond very well to positive reinforcement dog training. Correct obedience training is highly advised as they are large and assertive. 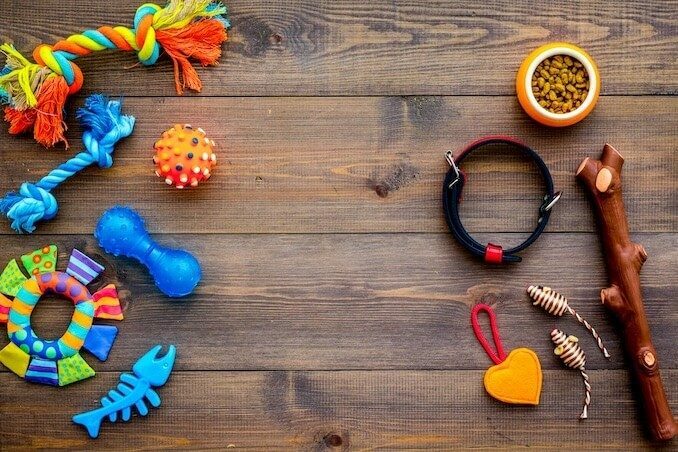 This breed loves to be busy and therefore training can even be made enjoyable once a positive and mutual relationship is established between you and your loving companion. Remember that the German Shepherd and Husky breeds are dominant working dogs who love to be active. It is therefore essential that your German Shepherd and Husky Mix is well socialized. Try socializing your dog with other breeds, pets and people. The introduction of new beings will also be a treat for your pet. Socialization determines adult behavior in dogs. If your puppy is well socialized from a young age, then it will grow to be very friendly and outgoing. Dog parks, puppy classes and daily outings will provide your dog with regular socialization which will also provide mental stimulation. Mental stimulation is very important for such a breed or your dog may get restless and destructive. 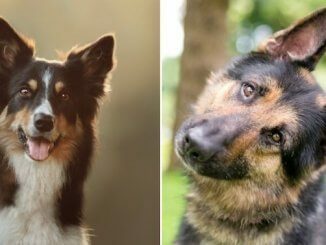 Originating from two working dog parents, your pooch will require lots of games and it’s no surprise that this breed thrives on challenges. Step one: Let your dog smell a treat or scented toy, while still holding the object. Step two: Hide the treat/toy. Step three: Allow your pup to sniff out the object. Step four: Watch as your pup enjoys his/her reward! The Gerberian Shepsky is a very observant breed and therefore providing your dog with a range of surroundings will keep them happy. When taking your pup out for an afternoon or morning run, simply keep alternating routes. This will leave your pup guessing and will stimulate their mind as they take in new and different surroundings. Canine hip or elbow dysplasia is a genetic disease associated with the German Shepherd. This disease is characterised as a disease of the hip or elbow which causes the joints to form incorrectly. This malformation can lead to pain and may ultimately lead to the loss of elbow and hip function. Eye problems such as the development of cataracts are prevalent in the Husky. Again, this may then be passed down to your German Shepherd Husky Mix Puppy. 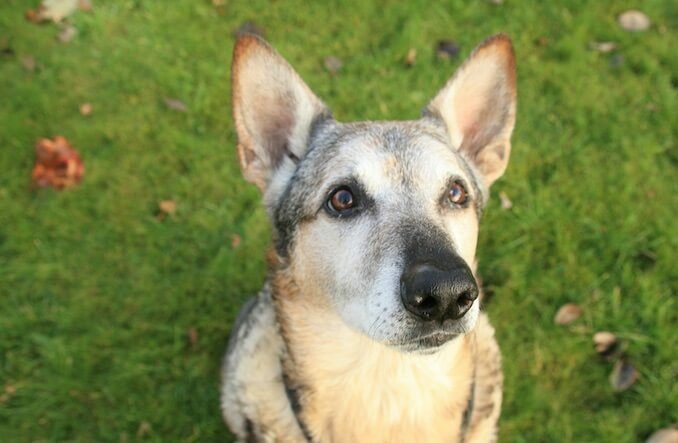 Cataracts are known as “imperfections in the eyes lens” and will affect your pup’s vision over time. Your pup may act confused or disoriented. Their facial structure has wolf-like features, with a strong muzzle and erect ears. Solid, bold and powerful. The German Shepherd Husky Mix is definitely an eye-catching breed. Their eyes may be brown like the German Shepherd or even blue or green which is found in the Siberian Husky; like all mixed dogs appearance and temperament aren’t predictable. In fact, the most sought-after pups will be those with the blue or green eyes. These puppies are undeniably gorgeous and will attract attention. Their coat is made for a colder climate, however, as this breed has a double coat, it is able to withstand warmer climates. Your pups double coat may additionally come in a range of different colours from the darker German Shepherd side of brown and tan with black, to the lighter Husky side of greys and whites. Either way, your dog will be bold and magnificent. The beautiful double coat of your Shepherd Mix will need regular maintenance so that it is kept that way. The condition of your dog’s skin and coat may also depend on a variety of factors. Brushing your dog two or more times per week is preferable. This will shed any unwanted fur and dander, which overtime may accumulate on your carpet or clothes. Expect a “blow-out” period for your dog. This blow out period will occur closer to the hotter months. They are just getting rid of unnecessary fur so they can regulate their body temperature more appropriately in the summer time. During this period, A LOT of fur will be shed. Don’t panic, just give your dog a hand and perhaps increase brushing during these periods. In terms of bathing. Stick to bathing your dog only when necessary; you do not want to disturb your dog’s natural oils which will be keeping their coat healthy and shiny. So, you’ve come this far. Are you convinced that the German Shepherd Husky Mix is the right dog for you? A striking, bold and wolf-like breed. Intelligent and protective yet extremely loveable and gooey on the inside. The perfect family dog. The perfect running companion. The perfect explorer! If you have time, patience and love and are looking for a large active dog; then this breed will be perfect for you. Do you own a Gerberian Shepsky? Please share with us your loving experience below.